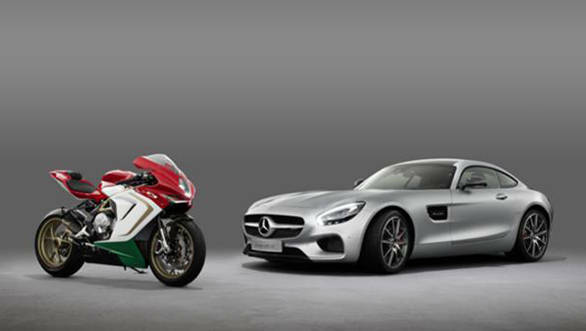 Following in the footsteps of Audi and Ducati, Mercedes-AMG and MV Agusta have announced that they have signed a cooperation agreement on a long term partnership in marketing and sales. Mercedes-AMG will also acquire a 25 per cent interest in MV Agusta and will appoint one member on to the Italian motorcycle manufacturer's board of directors. Neither side has made any disclosure on the financials of the transaction which should see regulatory approval by the end of November. Tobias Moers, chief executive of Mercedes-AMG commented "In MV Agusta, we have found the perfect two-wheel partner for Mercedes-AMG. The partnership provides us with an entry into a world of additional high-performance enthusiasts." The performance arm of Daimler AG, Mercedes-AMG is famous for its crackling V8 engines and thrilling sports cars and this partnership will allow the brand access to an even wider audience. They currently sell six AMG flavoured Mercedes-Benz models in the Indian market. Giovanni Castiglioni, president and CEO of MV Agusta, also commented on the new partnership saying "MV Agusta and Mercedes-AMG are a perfect brand fit: Two complementary companies that stand for design, high performance and excellence." This agreement will also widen MV Agusta's access to new markets across the globe. We've heard that they've been eying our market for a few years now and this might just be the push that opens the door to India for them.